Don’t mistake rhubarb for a fruit; although it is often cooked to eat as a dessert and commonly combined with other sweet fruits, rhubarb is technically a vegetable, it’s a member of the polygonaceae family and related to sorrel. Rhubarb is an excellent crop to grow in Britain, enjoying cool climates and suffering very few pests. A very large percentage of rhubarb is grown in the Yorkshire Rhubarb Triangle. Rhubarb flourishes in Yorkshire’s cold, damp soils. In the 1800s when the cultivation method was invented coal for the sheds was provided by nearby coal mines and fertiliser from the by-products of the wool industry. New plants grow for two years without harvest, storing energy from the sun in their roots as carbohydrate, like the human body stores fat. Frost causes plants to hibernate and transform the stored carbohydrate into glucose, crucial for forced rhubarb’s bittersweet flavour. It is the extreme tartness of the rhubarb that links it so much with its health properties. In general, fruits and vegetables with tart or sour flavours tend to be effective in aiding digestion and cleansing. Rhubarb is no exception; in fact, rhubarb is a high-fibre food, and combined with its astringent properties, it is amazingly successful as a diuretic and laxative. It is for this reason that rhubarb has a long history of being used strictly as medicine. Made into tinctures, syrups, and poultices, the plant had been used around the world in the treatment of constipation, diarrhea, gastro-intestinal disorders, menstrual disorders, sores, and ulcers for thousands of years. You may be shocked to learn that in the 5,000 years rhubarb has been cultivated, it wasn’t until the 18th century that it was grown for culinary purposes! Until that point, rhubarb was grown in Asia and shipped all over the world as medicine. Due to the risks and expenses of land transport, buying rhubarb would cost a person 10 times the cost of cinnamon, 4 times the cost of saffron, and almost 3 times the cost of opium. In fact rhubarb is now classified as a superfood for its ratio of health benefits to calories – only 7 calories per 100 grams. Savvy slimmers have also realised it actually speeds up the metabolism. High levels of calcium mean it is a fat-free alternative to dairy products which lowers cholesterol. Cooking rhubarb in a saucepan invariably leads to it becomingly stringy and somewhat overcooked no matter how hard you try. The easier way is to bake it in the oven at a low(ish) temperature – it cooks through well and yet stays tender and keeps hold of the shape. If you are making this after another oven activity such as the Sunday roast you can just pop this in the turned off oven whilst you eat your meal and by the time you’ve cleared the dinner plates and got out the pudding dishes the rhubarb will be cooked to perfection. Simple as. 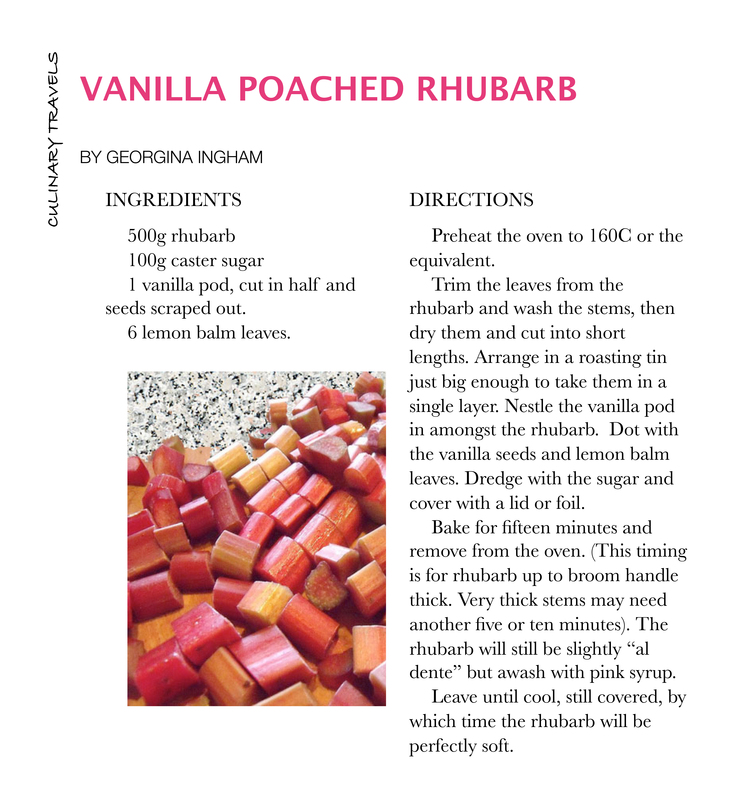 I like to add some vanilla and lemon balm to my poached rhubarb as it just gives a subtle fragrance, but, it would still be lovely without those additions. Serve with ice cream or clotted cream; or use in another recipe such as rhubarb bundt cake or filling for strudel.